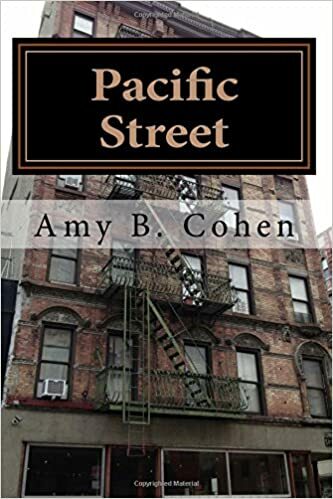 If the 1910s were years of growth for the families of Sarah Goldschmidt and Abraham Mansbach’s children and the 1920s were years of transition, the 1930s and 1940s were primarily years of loss. 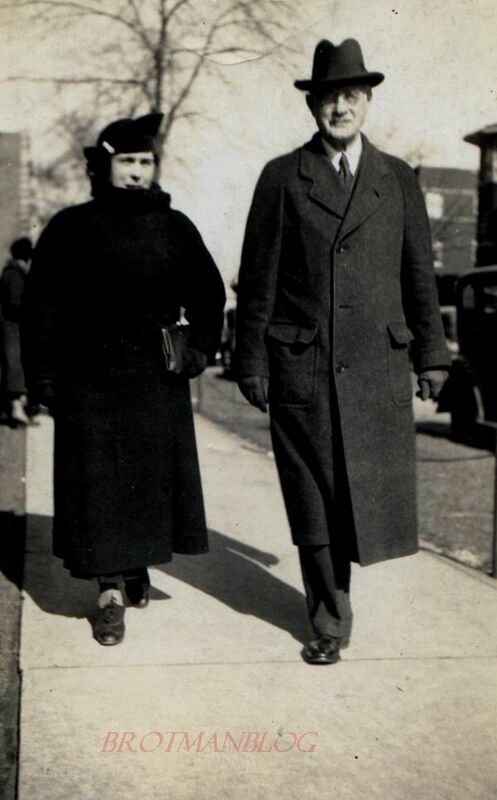 The following year, Corinne and Herbert’s daughter Rosalyn married Warren Jefferson Hahn in Philadelphia.3 Warren was born in Woodville, Rhode Island, on August 6, 1909, but grew up in Philadelphia where his father was a furniture salesman. 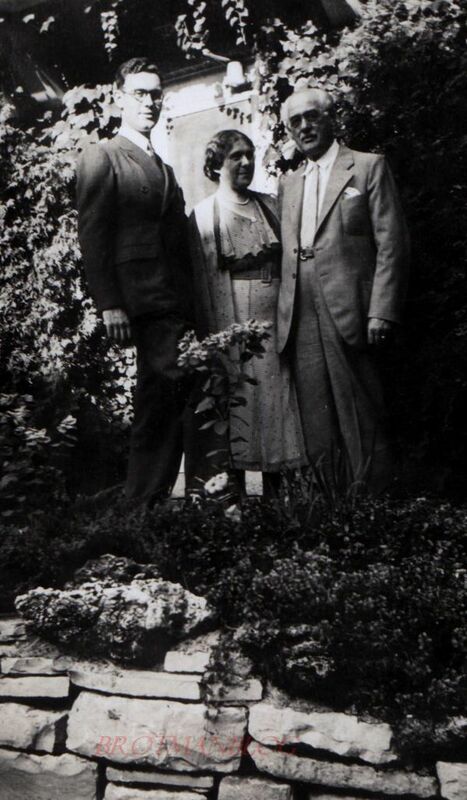 In 1930 Warren had been living with his parents in Philadelphia and working for a motion picture company.4 Rosalyn and Warren settled in Philadelphia. 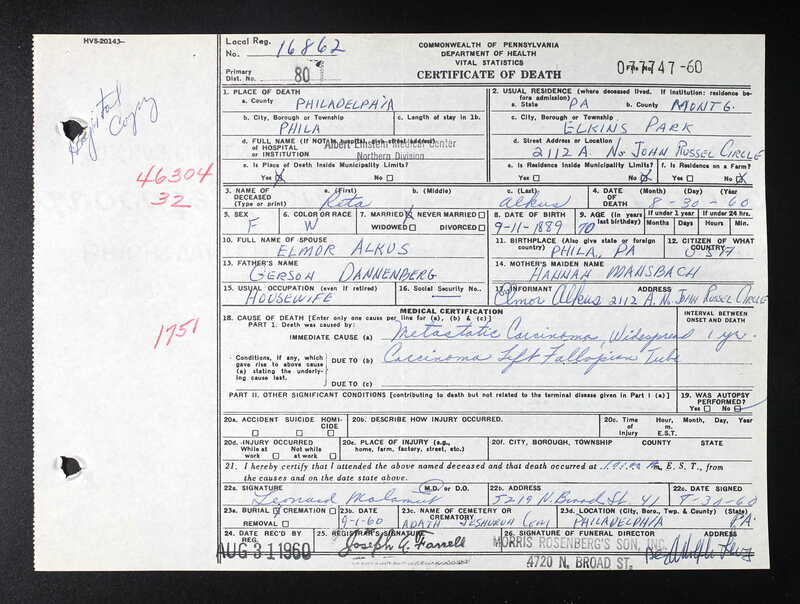 Rosalyn’s widowed mother Corinne also moved to Philadelphia, and it appears that Rosalynn’s grandfather Bert Mansbach did as well because Bert died in Philadelphia on March 6, 1939; he was 83 years old. New York, New York City Municipal Deaths, 1795-1949,” database, FamilySearch (https://familysearch.org/ark:/61903/1:1:2WP2-SWW : 10 February 2018), Betty Mansbach, 10 Apr 1941; citing Death, Manhattan, New York, New York, United States, New York Municipal Archives, New York; FHL microfilm 2,130,228. Now when I saw the name Julius Adler, something rang a bell (it amazes me that any names stick in my head these days). So I searched on my tree, and sure enough, I did have a Julius Adler on my tree, and in fact, I already had entered Katinka as his second wife but hadn’t realized she was my relative (I had to merge the duplicates on my tree). Why was Julius already on my family tree? Arthur M. Dannenberg, 99, a pediatrician who made house calls, died Friday at his home in Philadelphia. 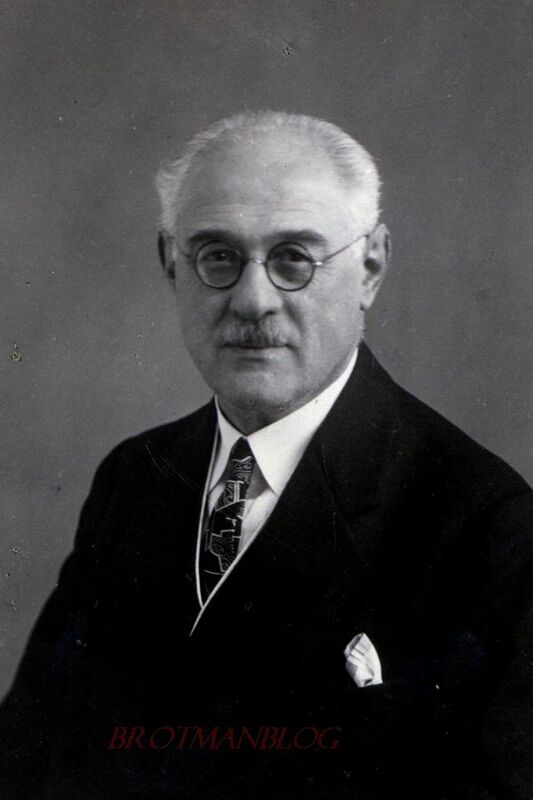 Dr. Dannenberg graduated from the University of Pennsylvania School of Medicine in 1913 and did his internship at the Jewish Hospital, now known as Albert Einstein Medical Center. From 1938 until his retirement in 1968, Dr. Dannenberg was chief of pediatrics at the center. During Dr. Dannenberg’s career, he wrote numerous articles on pediatrics that were published in medical journals. He was a member of the Philadelphia County Medical Society, the American Medical Association and the American Academy of Pediatrics. He was a past president of the Philadelphia Pediatric Society. 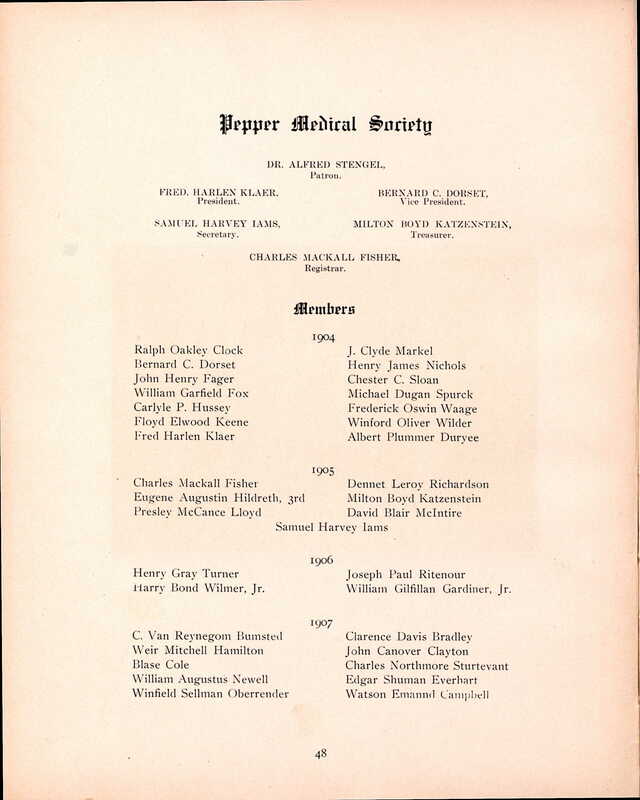 He also was a member of the Council of the College of Physicians of Philadelphia. Meyer’s wife Ida Jaffa Mansbach died almost exactly a year after her husband on December 2, 1941. She was 66.18 Meyer and Ida’s son Arthur died just nine years later on May 4, 1950; he was only 53.19 His wife Gertrude lived another 28 years, dying at age 77 on June 3, 1978. 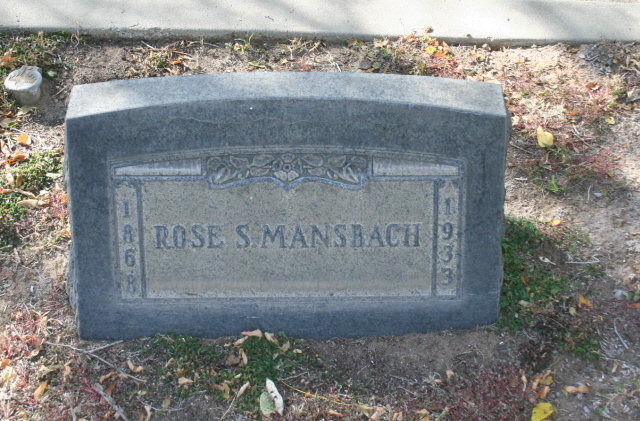 She had remarried in 1954.20 Finally, Edith Mansbach Marshuk died on March 20, 1968; she was 66. Her husband Herbert had predeceased her, dying on October 5, 1959.21 Meyer, Ida, and their children all died and are buried in Los Angeles. That brings me to the end of the story of those children of Sarah Goldschmidt and Abraham Mansbach who came to the US. There is one more line of the Goldschmidt-Mansbach familiy to discuss: the family of Breine Mansbach Bensew, the one sibling who did not come to America herself. In my prior post, we saw how the family of S.J. Katzenstein had moved on from Little Washington, Pennsylvania, after S.J. died. 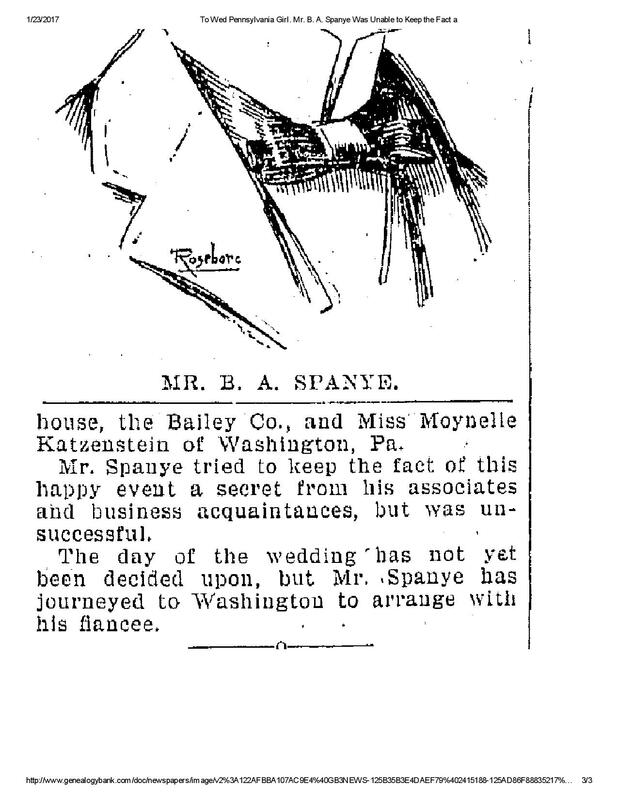 His daughter Moynelle married Bert Spanye, who was a very successful businessman in Cleveland, and all but one of the five Katzenstein sons as well as S.J.’s widow Henrietta had also moved to Cleveland. 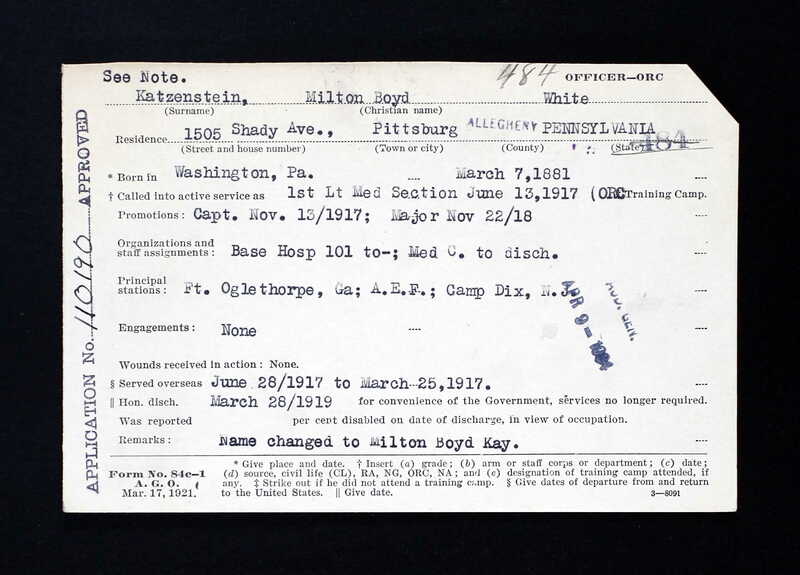 Two sons went to college, and three served in World War I.
Moynelle and Bert had two children, Edward and Margaret. When Bert retired in 1924, Edward was working as a salesman and still living at home with his family in Cleveland in 1924. Margaret was just thirteen. Then on July 2, 1926, Edward died at age 23 from a “twisting of mesentery by ileus of small bowel.” According to my medical consultant, the mesentery contains the blood vessels to the intestines, and when it twists, it can lead to “dead bowel” syndrome—that is, a blockage of blood to the intestines. Even today this condition is quite lethal if not treated quickly (and sometimes even with treatment). 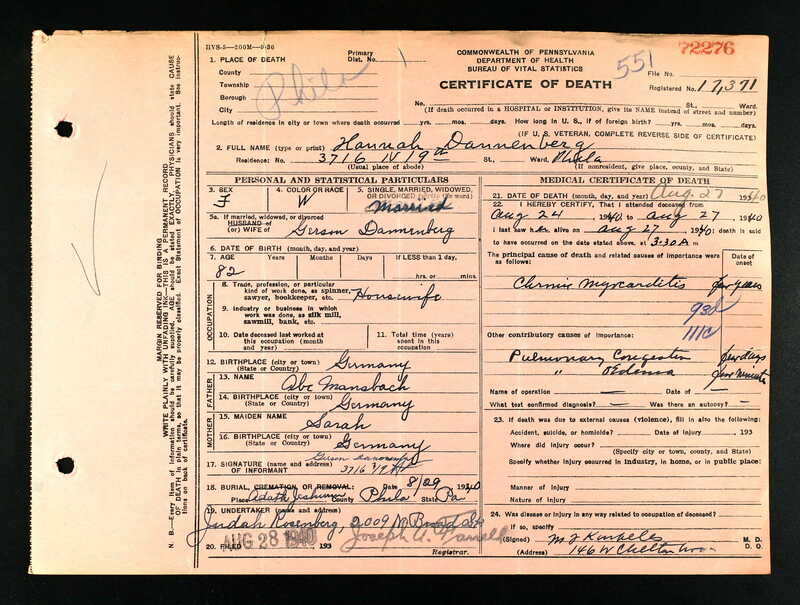 Edward’s death certificate states that he was an apprentice for a lithography company at the time of his death. What a terrible shock this must have been for his family. 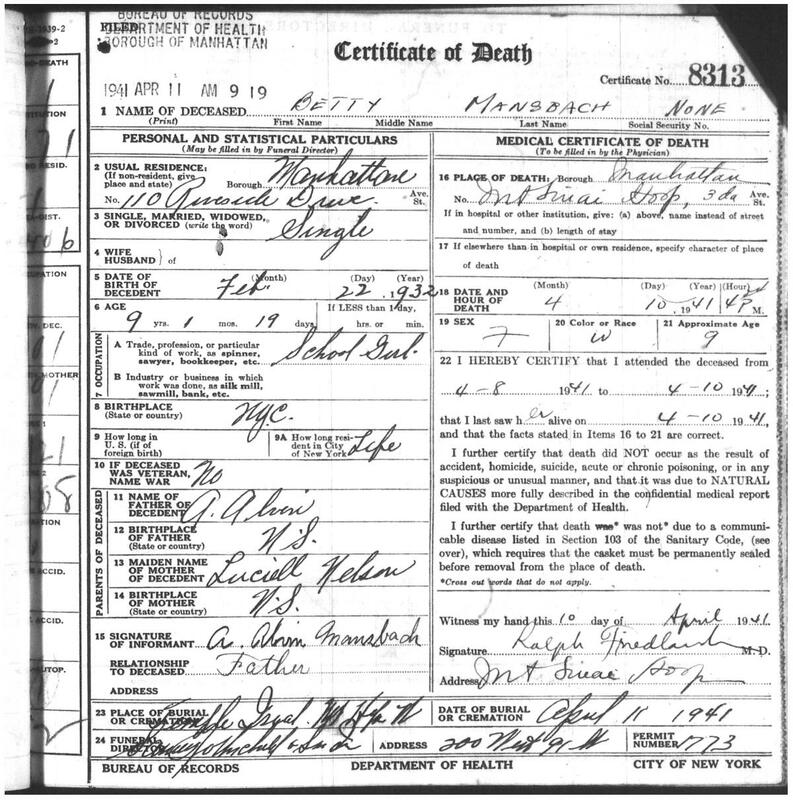 “Ohio Deaths, 1908-1953,” database with images, FamilySearch (https://familysearch.org/ark:/61903/3:1:33S7-9PJ1-S35L?cc=1307272&wc=MD9X-1PD%3A287601201%2C294566201 : 21 May 2014), 1926 > image 2692 of 3564. 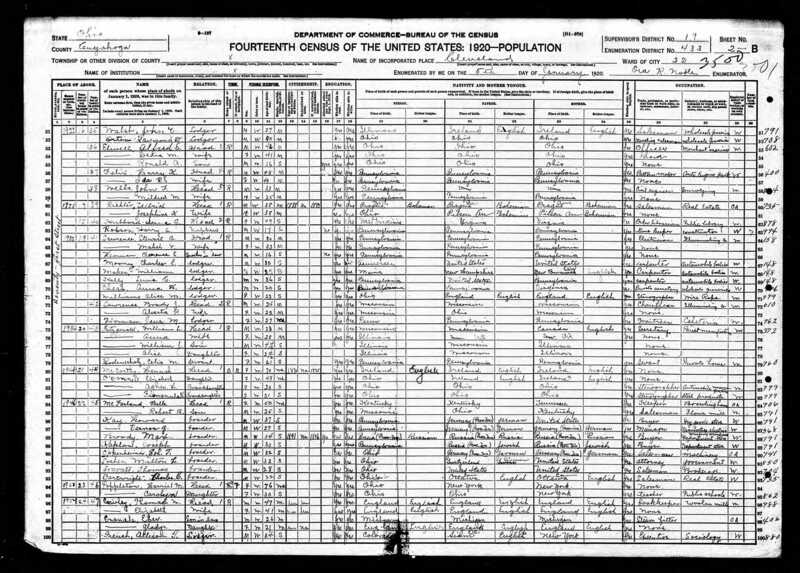 Original data: Michigan, Marriage Records, 1867–1952. Michigan Department of Community Health, Division for Vital Records and Health Statistics. Ancestry.com. 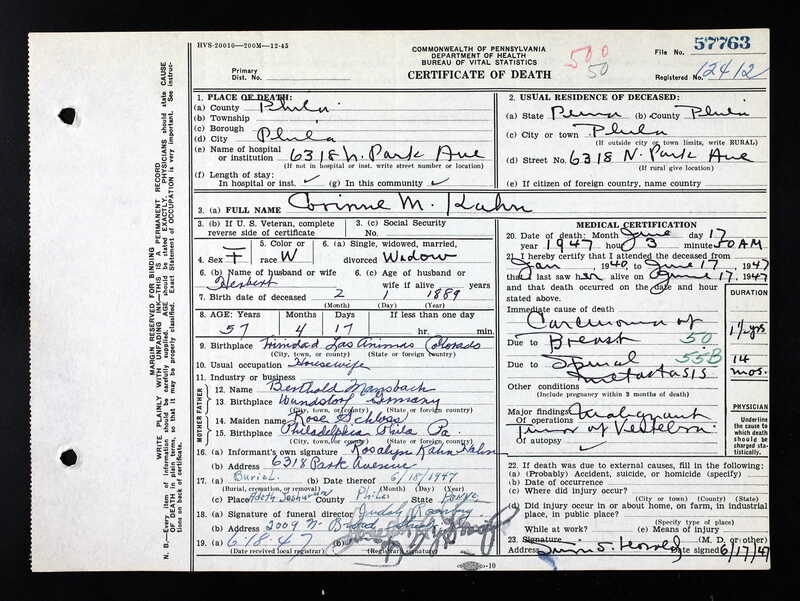 Michigan, Divorce Records, 1897-1952 [database on-line]. Provo, UT, USA: Ancestry.com Operations, Inc., 2014. 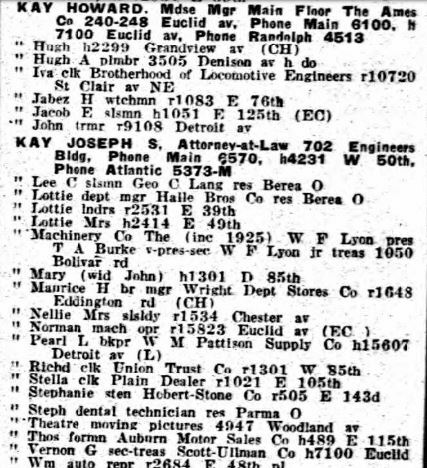 The other brothers—Howard, Earl, Ivan, and Vernon—are missing from the Cleveland directories for several years after 1921. In 1927, however, three of them are listed in the directory for that year. Earl was working as a salesman for the Scott-Ullmann Company and living with his sister and her family at 11338 Belleflower; Howard was a merchandise manager for The Ames Company, still living at 7100 Euclid Avenue, as was his brother Vernon, who was the secretary-treasurer of the company where his older brother Earl was a salesman, Scott-Ullman. Ivan is not listed, and I am not sure where he was living at that time. The oldest brother M. Boyd Kay was still living in Detroit in 1930; he was living in a hotel and practicing medicine. By 1932, he had relocated to Miami, Florida. 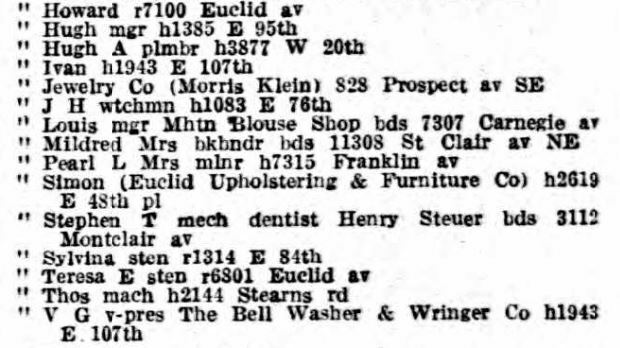 I couldn’t find Howard on the 1930 census, although I found his 7100 Euclid Avenue address on the census report. He was not listed in what appears to have been a multi-family dwelling at that location. I also could not find the Moynelle and her family on the 1930 census despite having the exact address of where they were living (11338 Belleflower Road, their home since at least 1910). In 1930, Bert, Moynelle, and Margaret traveled together to Europe and listed their address as 11338 Belleflower Road in Cleveland. 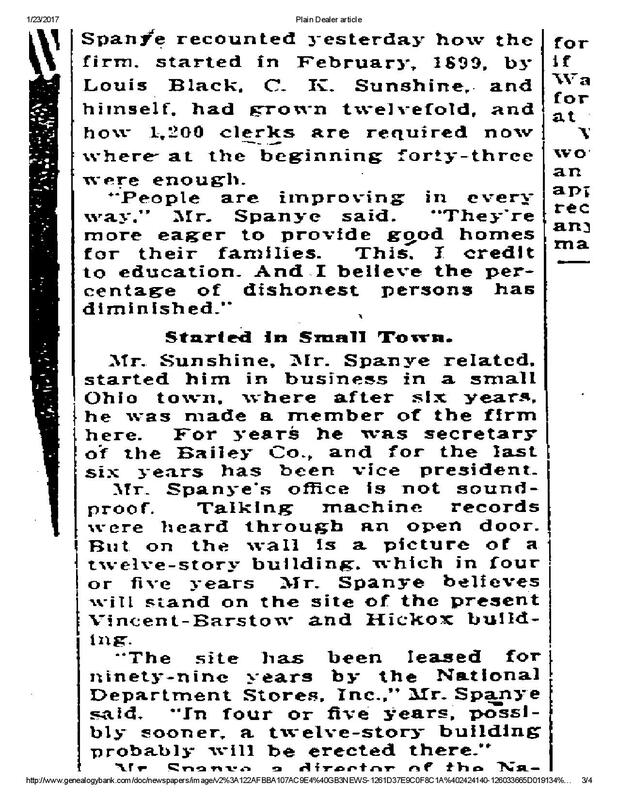 Yet when I went through the enumeration district that includes that address on the 1930 census, that house number was not listed nor was the Spanye family. On January 4, 1933, Moynelle and Bert’s daughter Margaret (also known as Mardi) married William Saul David Wolf. William, also a Cleveland native, was the son of Jacob Wolf and Jennie Schonberger and was working as a salesman when they married. Ancestry.com. 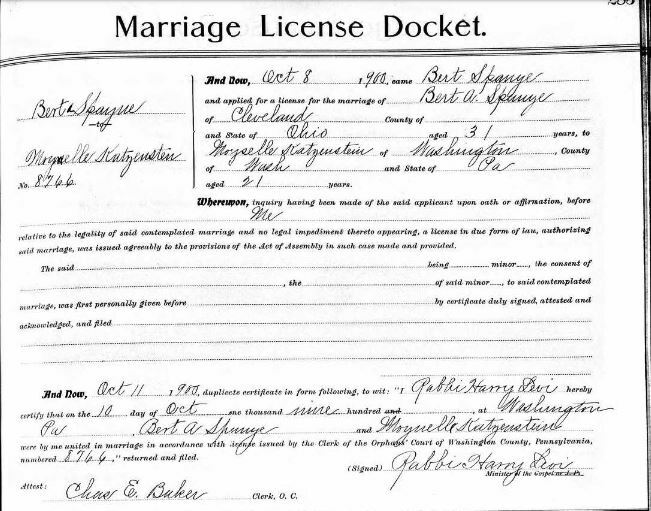 Ohio, County Marriages, 1774-1993 [database on-line]. Lehi, UT, USA: Ancestry.com Operations, Inc., 2016. Original data: Marriage Records. Ohio Marriages. FamilySearch, Salt Lake City, UT. Margaret (also known as Mardi) and William had two children in the 1930s. 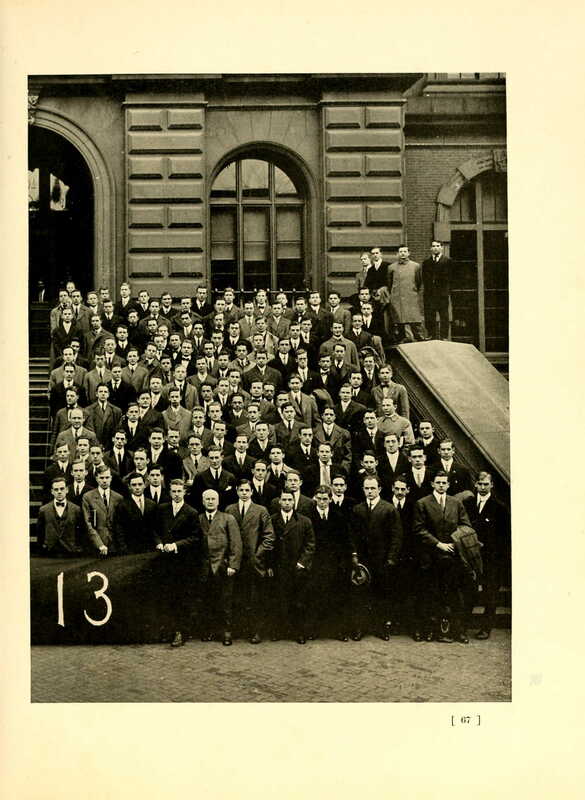 Meanwhile, none of the Katzenstein/Kay sons were married as 1935 began. Then, on June 1, 1935, the youngest child of S.J. Katzenstein, Vernon, married Beatrice L. Miller. They were married by a rabbi in Cleveland. Vernon was 43, Beatrice 29. Vernon listed his occupation as an engineer. 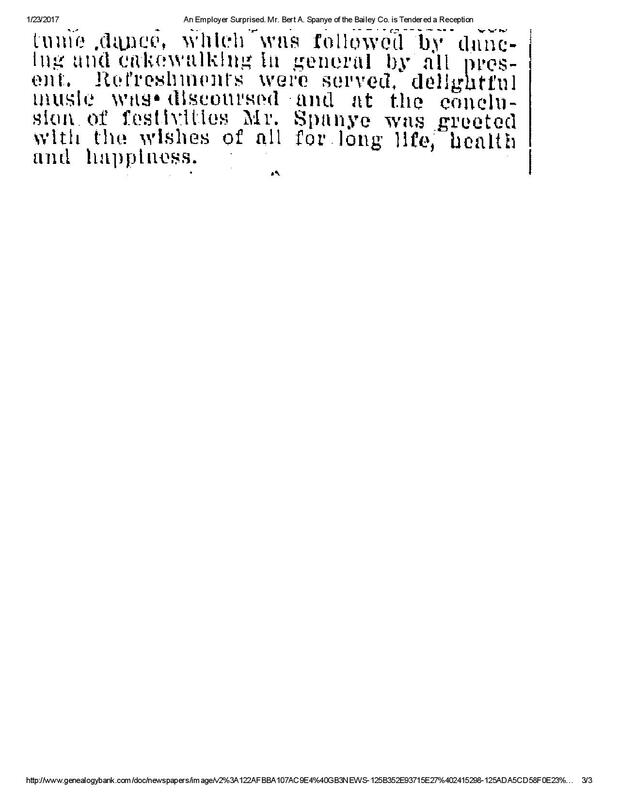 On June 1, 1936, Henrietta (Sigmund) Katzenstein died at age 84. 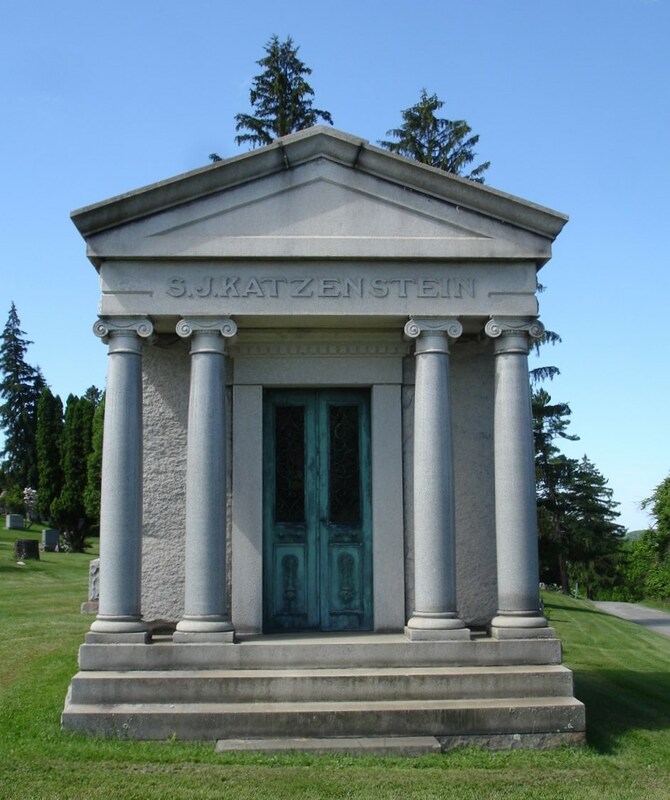 She was buried in Washington Cemetery in Washington, Pennsylvania, with her husband S. J. Katzenstein, who had died 35 years before. (This information was provided by the Washington Cemetery and is also found on FindAGrave and here.) She was survived by her six children, five of whom had lived nearby in Cleveland. When she died, only two of her children were married, and she had just one grandchild, Margaret Spanye Wolf, her daughter Moynelle’s daughter. Within a few years of Henrietta’s death, several of her sons married. Earl married Violet Heineman Willis on May 29, 1937. She had been married once before and widowed. She was 39 and working as a bookkeeper when they married. Earl was 51 and living at the Hotel Statler and working as a salesman. They were married by a justice of the peace. On March 30, 1940, Milton Boyd Kay married Cassie Leopold Winkler in Miami. She was a widow who had previously lived in Pittsburgh before her first husband Leo Winkler died, so perhaps M. Boyd knew her from his days living there. He was 59, she was 57. They were married by a county judge. Ancestry.com. 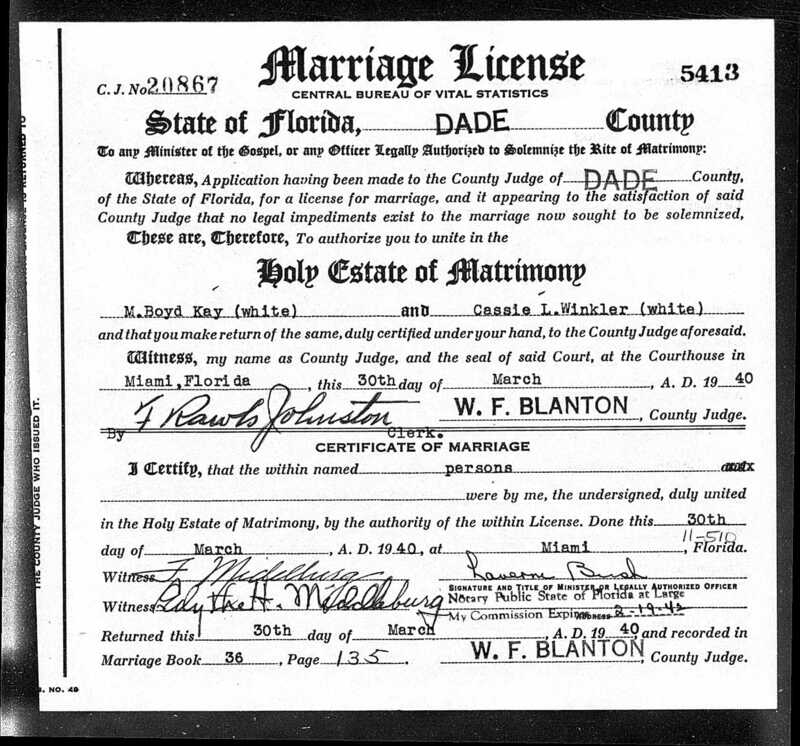 Florida, County Marriages, 1823-1982 [database on-line]. Lehi, UT, USA: Ancestry.com Operations, Inc., 2016. Original data: Marriage Records. Florida Marriages. FamilySearch, Salt Lake City, UT. 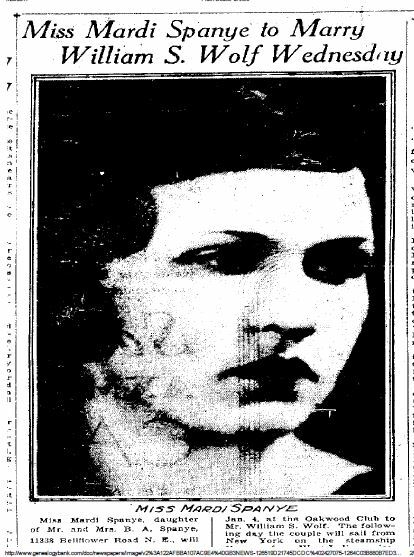 On July 15, 1940, Howard Kay married Estell Goodhart Kaufmann in Cleveland, though he was already residing in Miami by then; he was 57, she was 47 and had been widowed twice before marrying Howard. Estell had also grown up in Cleveland, so perhaps Howard had known her when he was younger. On the marriage registry, Estell gave her address as 11338 Belleflower Road, the address where Howard’s sister Moynelle and her family as well as his mother and he and his brothers had lived at various times over the years. 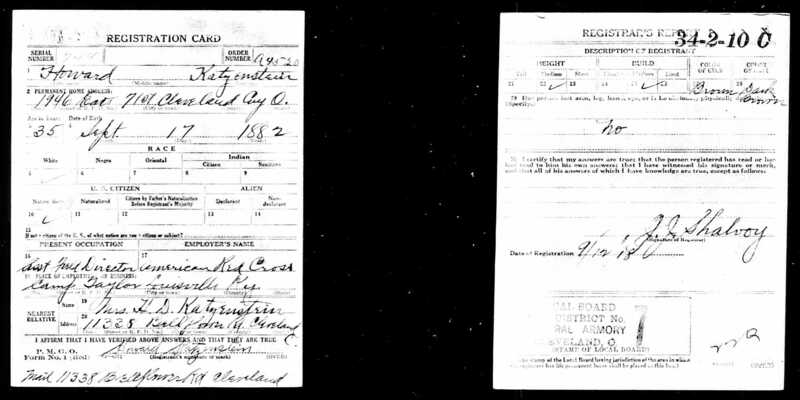 Howard reported his occupation as a hotel manager on the marriage record. Although I don’t have the exact date, Ivan was also married by 1940, as indicated on the 1940 census. His wife’s name was Rhea Kaufman, and in 1940, she was 50, Ivan was 55. 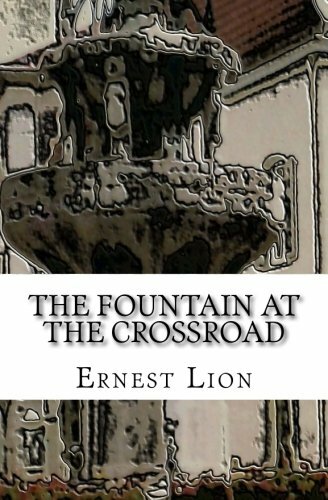 Rhea was an instructor for a telegraph company and Ivan was still a superintendent in a department store. 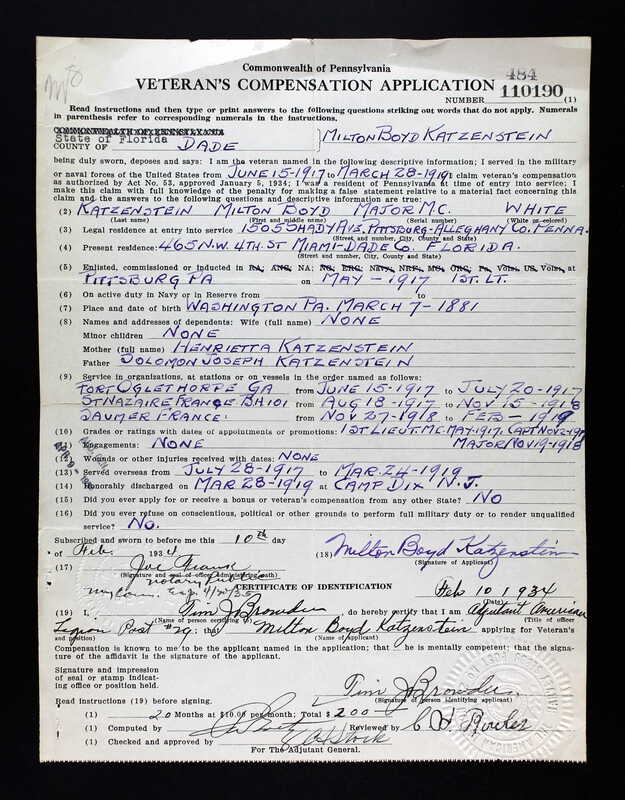 Thus, within a few years after their mother died in 1936, all five Katzenstein/Kay sons were married whereas none had been married at the beginning of 1935. 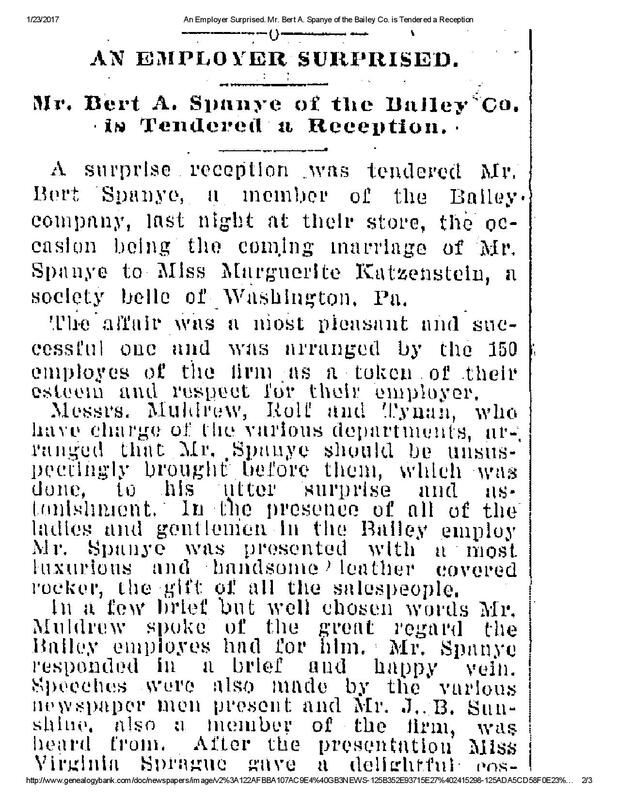 In 1940, Moynelle and Bert Spanye were counted twice on the census. First, on April 9, they were included in the census report for Miami, Florida, where they were guests in the Triton Hotel, along with their daughter Margaret. Moynelle’s brother Howard was also residing in the hotel and is listed as the hotel manager. 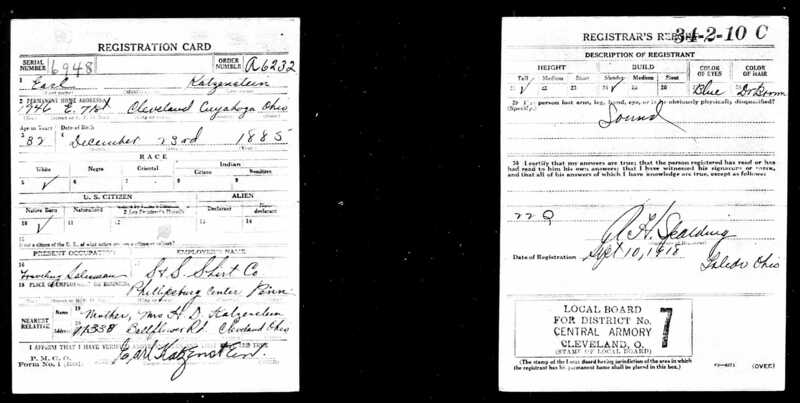 But on April 12, 1940, Bert and Moynelle were enumerated in Cleveland at their home at 11338 Belleflower Road; Bert reported that he was now working in the real estate business. 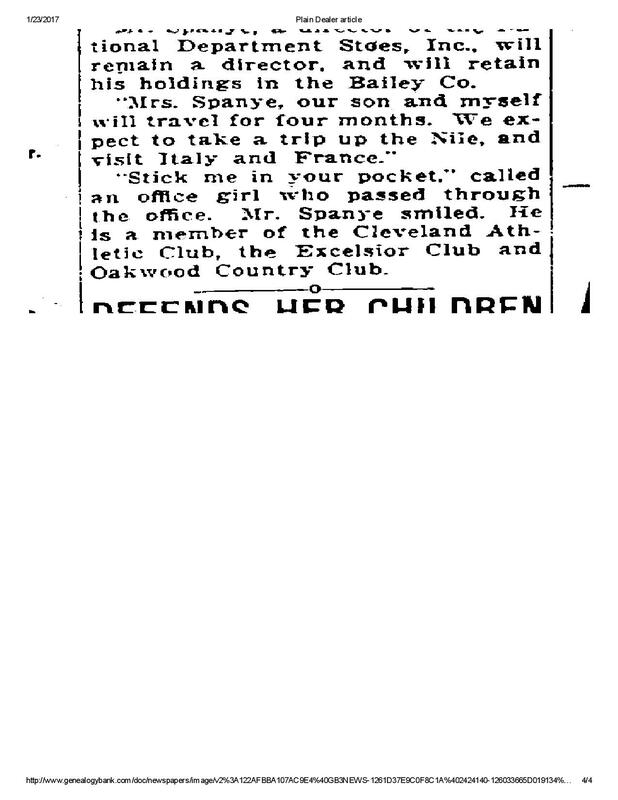 And Margaret was back with her husband and children in Cleveland by April 26, when they were enumerated. William was a salesman for a gas valve manufacturing company. 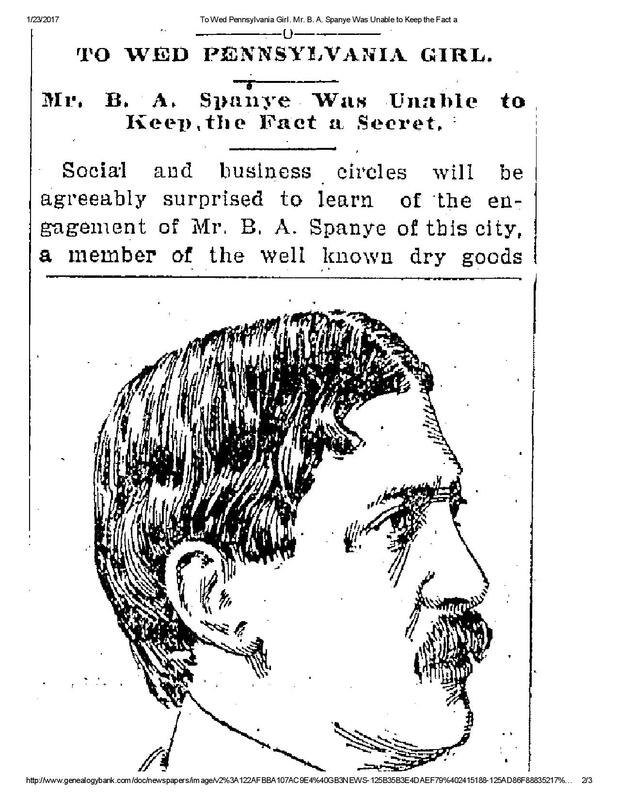 Six months later, on November 20, 1941, Bert Spanye died at age 73 in Miami, according to the Florida Death Index on Ancestry. 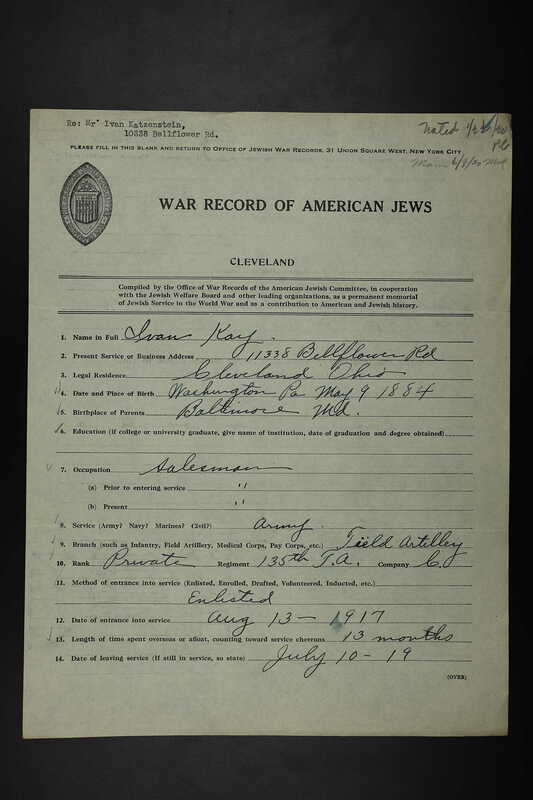 Three and a half years later Moynelle Katzenstein Spanye died on March 14, 1945 in Cleveland, according to the Ohio Deaths database on Ancestry. She was 76 and was survived by her daughter Margaret and her two grandchildren. She also was survived by her five younger brothers, Milton, Howard, Ivan, Earl, and Vernon. In 1945, Howard Kay and his wife Estell were living in Miami where Howard was now an account executive with Merrill Lynch. He died four years later on February 12, 1949, in Miami, and was buried at Mayfield Cemetery in Cleveland. He was 66 years old. 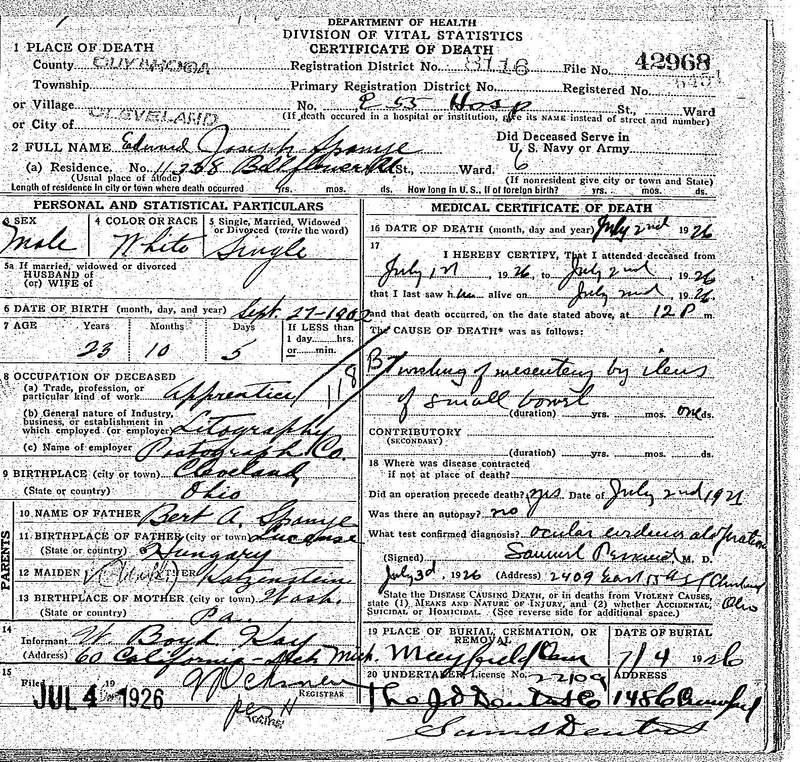 Estell died four years later on August 9, 1953, and she is buried with Howard at Mayfield Cemetery, according to information provided by the cemetery. She was 60 years old. 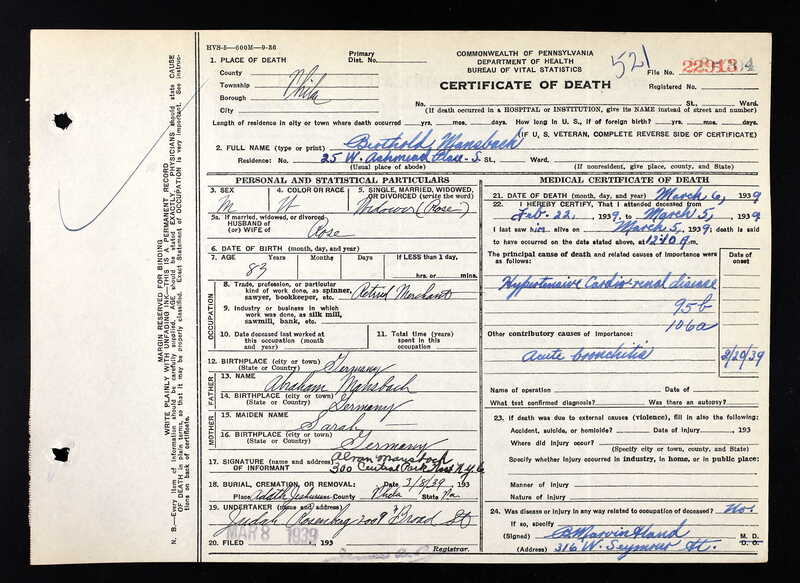 M. Boyd Kay, aka Milton Boyd Katzenstein, died on October 13, 1952, in Miami, according to the Florida Death Index. He was 71. He was buried in Washington, Pennsylvania, where he’d been born and where his parents were buried. His widow Cassie died in 1964 when she was 81, and she was buried at West View Cemetery in Pittsburgh, where her first husband Leo Winkler was buried. The remaining siblings, Ivan, Earl, and Vernon, all lived much longer lives. In 1942, Ivan and his wife Rhea were still living in Cleveland where he was employed by the May Company. By 1945, they had moved to Miami as had Howard and Milton and their wives. Ivan lived in Miami until he died on July 6, 1972, according to the Florida Death Index. He was 88 years old. His wife Rhea died a month later on August 7, 1972; she was 82. I do not know where they were buried. Vernon Glyde Kay and his wife Beatrice were also still in Cleveland in 1942, but like his brothers, he also moved away. Although I’ve not found any records or even news articles about his life after 1942, his wife’s obituary revealed some information about their lives. They lived in Chicago for a number of years and then in Hartsdale, New York. When I read that, I realized that they were living only a few miles from where I was living as a child. Vernon was my grandmother’s first cousin and was living close by, but I never met him and doubt even my father would have known who he was. The last surviving child of S.J. Katzenstein and Henrietta Sigmund was Earl. Like his brothers Howard and Ivan, in 1942 he and his wife Violet were still residing in Cleveland. They were living at the Commodore Hotel, and Earl was working for Kay-Dee Tailoring Company. He and Violet relocated to Miami by 1945, where he was retired. But Earl and Violet did not stay in Miami. By 1954, they had relocated to San Diego, California, where they lived for the rest of their lives. According to the California Death Index, Earl died on January 6, 1979. He was 93 years old. Violet died September 20, 1983; she was 86. Like S.J. 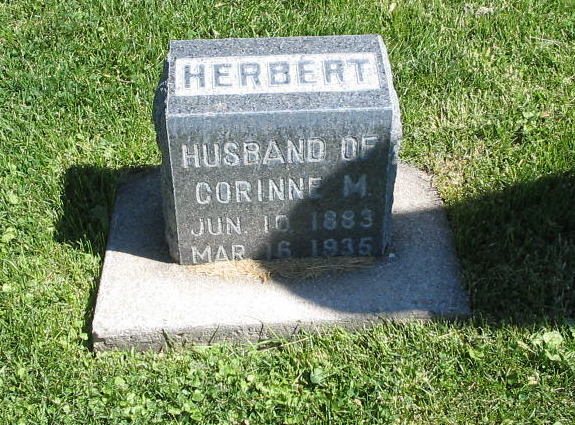 Katzenstein, his wife Henrietta, and their sons Vernon, Howard, and Milton, Earl and Violet were buried at Washington Cemetery. Looking back at the children of S.J. Katzenstein and Henrietta Sigmund, they appear to have been a close family. Five of the six lived close to each other for most of their adult lives—growing up in Washington, Pennsylvania, then moving to Cleveland, and finally retiring to Miami. All five of the brothers married late in life, four not until after their mother died in 1936 when they were already in their 50s; none of the five brothers had children. In fact, only their sister Moynelle had children, and only her daughter Margaret survived to adulthood and had children of her own. Fortunately, for me, one of Moynelle’s descendants is my cousin Roger, whose husband David has been such a tremendous help to me in my research of the Katzenstein and Goldschmidt families.